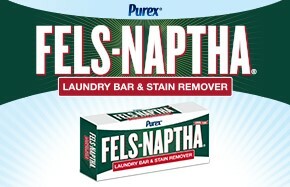 Purex Fels-Naptha is a powerful laundry bar that works overtime to remove greasy, oily stains, perspiration, and ring-around-the-collar. With over 100 years of removing America’s stains, you can rest assured that this laundry bar knows how to tackle your toughest stains. All you’ve got to do is rub the stain with a wet bar of Purex Fels-Naptha and let it sit for a few minutes. Then wash your clothes as you normally would and say farewell to tough stains for good. How do I use Purex Fels-Naptha as a pre-treater? For optimal use as a pre-treater, collars and stain areas should be wetted with water and then a Purex Fels-Naptha Laundry Bar can applied to the affected area. Can I use Purex Fels-Naptha to treat severe soils? Yes. For severe soils use a soft brush to work Purex Fels-Naptha into the pre-wetted soiled area, prior to washing the garment in regular a washing machine. Can Purex Fels-Naptha be used as a laundry booster? Yes, for a stain boost to a wash load, finely grate 1/2 of the bar (use less for smaller or less soiled loads) into the washer, fill washer with water, and agitate for several minutes before adding clothing. Can Purex Fels-Naptha be used as a pre-treater? Yes, it is okay to use Purex Fels-Naptha as a pre-treater and then add to a wash load with chlorine bleach. The bars are available in 5.5 oz. They retails for less than $2 at Walmart and other mas stores. It makes GREAT Home made Laundry detergent!! 2 small containers of Oxy Clean or store brand Oxy Clean (try to get about 3.5 lbs total (1.58 kg)) found in the detergent isle. You should be able to find all of these items at your grocery store. This detergent is fairly mild smelling, it is not over powering. If you love a strong scent you may have to add a fabric softener or laundry crystals to each load. You can find laundry crystals in the detergent isle. 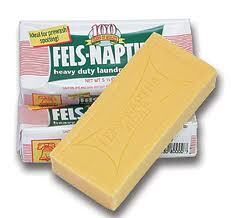 Start out by grating your Fels-Naptha soap just like cheese. You can use a food processor or just use your hand held grater, what ever you have. Those of you with an HE washer may want to run the mix through the grater again to get an even finer mix. Toss all ingredients in a 5 gallon bucket lined with a garbage bag. This part makes your whole house smell great. Once everything is mixed store soap however you like. The recipe makes about 2 gallons worth of detergent. I was reading other bloggers post about this detergent and it has lasted them 9 months to a year! Wow! Thats only $22 for a YEAR of detergent! What a wonderful blog post. Thank you so much for sharing this information with us.